FRIENDSWOOD — The Friendswood Lady Mustangs left no doubt as to who was going to claim the 22-5A golf title as they literally ran away with the district tournament played at Moody Gardens Golf Course in Galveston. The Lady Mustangs carded a 352-336-698 total to finish ahead of second-place Crosby who was 154 strokes behind at 848. Friendswood's Heidi Demel shot two straight rounds of 74 for a 148 total to claim individual medalist honors. “Heidi played really well - there was no weak part of her game,” Friendswood head coach Scott Smith said. “She drove the ball well, she chipped well, and she was throwing darts at the pins. 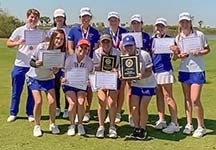 Second place belonged to teammate Hannah Johnston who shot 88-79 for a 167 total while Friendswood freshman Qingyang (Joy) Li advanced as a medalist with rounds of 90-87 for a 177 total. Other members of the team are Railey Adkins, Olivia Farber, and Genna Dancey. Friendswood will compete at the regional tournament on April 22-23 at The Golf Club at La Torretta in Montgomery.